The balance of power in boxing has shifted dramatically. 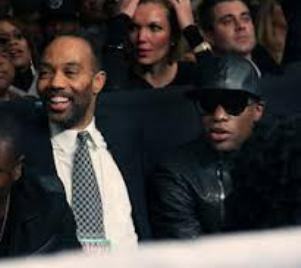 Floyd Mayweather Jr. and advisor Al Haymon hold all the cards right now. Mayweather’s exclusive deal with Showtime, which is a 6-fight deal spanning a period of 30 months, is expected to pay him no less than $200 million and up to $250 million if he achieves a certain level of pay-per-view success. That number has not been revealed, but numerous reports have stated he would have to increase his average buy rate, which currently stands at about 1.1 million (9.6 million buys over 9 career PPV fights). Conventional wisdom would lead most to say that the balance of power has shifted to Showtime. And while that might be true in one sense, Showtime is the one who opened up the check book for a fighter now 36 years of age and with a tendency to fight whenever he feels like it. The purse guarantee, which is also classified, would have to be near the $30 million mark. Mayweather was guaranteed a record $32 million purse for his May 2012 fight with Miguel Cotto, and for him to jump to Showtime no one would expect him to go for less than that. Mayweather’s purse in the Cotto fight was due in part to Cotto’s star power and status as the third biggest draw in the sport. And if we’re being honest here, the only fighters out there that are options for future Mayweather fights fight in Golden Boy’s stable. Mayweather won’t be doing business with any Top Rank fighters any time soon. And when looking at the likes of Danny Garcia, Marcos Maidana, Lucas Matthysse, Devon Alexander, and Amir Khan, it’s hard to see a scenario where one of these fights could generate the same box office success as Miguel Cotto. 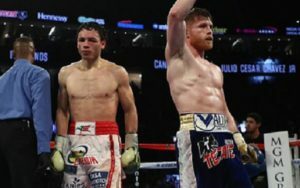 Canelo Alvarez is the only Golden Boy fighter with the potential star power to make a purse minimum even worth it. So what exactly is Showtime paying for? They’re paying for the attraction that is Mayweather and the shot at becoming number one in boxing broadcasting. Ideally over time, this deal would generate more revenue to be used towards its boxing budget, which up until now has been second to HBO’s budget. Along with Mayweather comes a stable of fighters from Golden Boy Promotions and Mayweather Promotions (who only promotes alongside GBP), whose associations with Mayweather will increase their market value all that much. If you aren’t so sure, just look at Saturday’s Showtime Boxing broadcast. 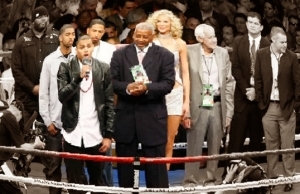 Ishe Smith, a Mayweather Promotions fighter, headlined in his first world title shot against Cornelius Bundrage, a recent addition to Golden Boy’s roster. The undercard featured J’Leon Love, yet another Mayweather Promotions fighter. Young prospects Badou Jack, Lanell Bellows, and Luis Cubas Arias fought off-tv, but on the same card. With HBO being left in Mayweather’s dust, they are now left solely with Manny Pacquiao as their only PPV option. And as we’ve seen in the past, Bob Arum has no compunction about taking Pacquiao over to Showtime. There is no real guarantee that Pacquiao will fight beyond this year, leaving HBO without a proven PPV attraction. Adrien Broner is being pushed along as the next big box office attraction. He’s young, fast, powerful, and brash. Adrien Broner has loads of talent, will tell anyone listening how talented he is, and he backs it up in the ring. Broner could very well end up as a big PPV star, given the right opponents on the way up. Did I mention Broner is also an Al Haymon guy? The real winners here are Mayweather and Haymon. Mayweather gets carte blanche for the remaining years of his career, and Al Haymon gets Showtime in the palm of his hand as he positions himself to strengthen his hold on HBO with Adrien Broner. 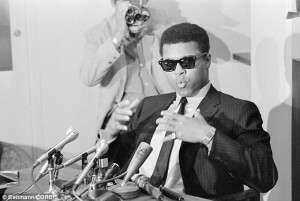 If the reports of a guaranteed purse minimum are true (and all logic would lead one to believe they are), Mayweather can go into cruise control for the 30 months of his deal and walk away with a cool quarter of a billion dollars. Mayweather and Haymon will wield a big stick in dealing with Showtime. 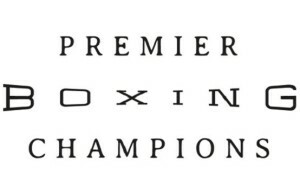 And with only two premium outlets for boxing, it means slim pickings for anyone else. Boxing Tribune Editor-In-Chief Paul Magno returns this week, so you can expect the return of Tim’s “Broken News” this Thursday. You can email Tim at timharrison65@gmail.com, or follow him on Twitter at www.twitter.com/TheTimHarrison.